The amateur footage, said to have been captured by a pilot filming the landing of a US Navy F-15 fighter jet aboard the USS Gerald Ford, sparked a debate about the video’s authenticity. 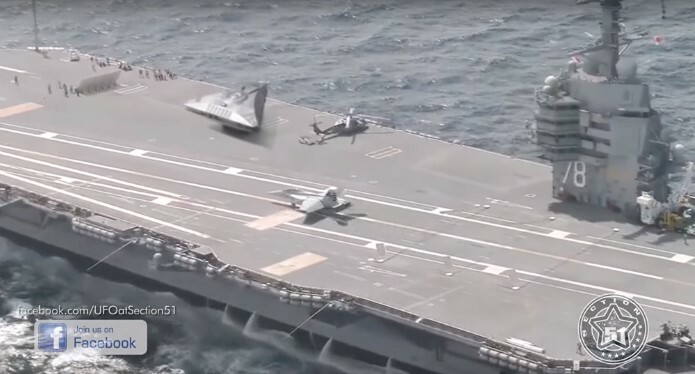 The video, published by ‘Section 51’, a US-based YouTube channel collecting footage of unidentified flying objects, shows a fighter shadowing a US jet as it comes in for a landing aboard the carrier, accidentally sighting a grey metallic triangle-shaped object parked next to a Navy helicopter. 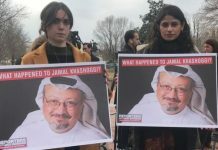 The footage, slowed down for effect and accompanied by appropriately eerie music, has racked up 500,000+ views on YouTube, and pitted users into a debate on whether the video has been tampered with. Multiple users were sure that it was the TR-3B, an alleged ultra-secret anti-gravity spy plane vehicle some believe is being developed by the US Air Force. 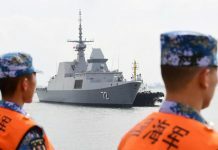 Others suggested the object was Photoshopped into the footage, joking about the triangle craft’s “stealth shadow.” “Nice CGI,” one user said, complementing the author. “Pretty sure they wouldn’t leave it parked on the deck of an aircraft carrier were it an alien spacecraft or some sort of secret technology,” another skeptic noted. “So tell me why a craft which can defy gravity and travel faster than anything known by mankind, which doesn’t use fossil fuel stands on the deck of an aircraft carrier?” another user asked. Some simply weren’t sure what to believe. “The problem with today’s CGI is that it’s getting damn near impossible to know what is real and what is fake. Unless you’re right there to actually witness it with your own eyes, when you see a compelling video and wonder if it’s real or fake, sometimes all you can do is shake your head and shrug your shoulders,” one user said. Eventually, ufoofinterest.org, a site whose self-described purpose is to ‘debunk hoaxes, conspiracies and misinformation,’ crashed the conspiracy party, showing the footage with the ‘UFO’, along with the original US Navy training footage, with no ‘UFO’ anywhere in sight. Triangle shaped #UFO spotted on US Aircraft Carrier in Mediterranean Sea? It's interesting to check out which sources the #hoax promoter and #CGI artist SECTION 51 used to fabricate his latest video.